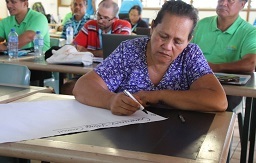 Niuean communities and businesses that rely on the ocean are putting to use tools and knowledge acquired in March during the Australian-funded Ocean and Tides Workshop, hosted by Niue Meteorological Service. Participants from communities, the tourism sector and disaster management services report they are applying new knowledge for improved decision-making and better results. The 4-day workshop, which was held from 19-22 March, was planned in consultation with Niue Met Service and facilitated by ocean experts from the Pacific Community (SPC) and the Australian Bureau of Meteorology. It featured two days of technical training for the Niue Met Service Staff followed by two days of ocean stakeholder training and consultation with a wide range of user groups. In the weeks following the workshop, participants have indicated it has already made a difference in their work. “For me personally I am now able to understand tides, especially with the tide calendars,” says Mr. Robin Hekau of Niue National Disaster Management Office. “Before I would get a copy and would never look into it deeply but now I am able to read it and understand it more.” Participants received training on marine meteorology, technical skills and an introduction to ocean data tools, including tide calendars, real-time data from Niue’s new tide gauge, and the Pacific Ocean Portal – a website that makes ocean temperature, waves, sea level and other key forecast maps and graphs easily accessible. This is the seventh in-country Ocean and Tides Workshop delivered under the Climate and Oceans Support Program in the Pacific (COSPPac). The next workshop will be held in Samoa in May 2018. Since its inception in 2012, COSPPac has worked to build the capacity of Pacific Island Meteorological Services and other relevant agencies to understand and apply climate, ocean and sea level information for the benefit of island governments and communities. The Programme is implemented in partnership by the Australian Bureau of Meteorology, Geoscience Australia, SPC, and the Secretariat of the Pacific Regional Environment Programme (SPREP).